I was reading more of Clarkson’s The Picts today and came across his references to the burial of King Ecgfrith on Iona after the battle of Dunnichen. Ecgfrith’s burial is only mentioned by Symeon of Durham, which is quite late but its so unusual and nonchilant that it is believable. No other English king was buried on Iona, and as far as we know, he was the first king from anywhere buried there, so its not as if Symeon just chose a traditional burial ground. As Bridei was the victor of a battle where a major king fell – and therefore the overwhelming number of his forces also fell – he would have control over the battlefield and its dead. One interesting survivor might be the ealdorman/duke Berht (/Berhtred) who had led Ecgfrith’s forces to Ireland the year before and was certainly still around during the time of Ecgfrith’s successor. Assuming that Berht was with Ecgfrith in Pictland then he must have been captured by Bridei after the battle. Once King Ecgfrith was killed, Berht may have negotiated a truce for the survival of the remainder. He would have then been at King Bridei’s mercy. Nevertheless, we can be sure that Pictish King Bridei would have taken Ecgfrith’s body to Iona for burial. This was not an easy trip. The battle of Dunnichen was fought in southeastern Scotland. Iona is on the far western isles. We should imagine a royal baggage train bearing the body of Ecgfrith out in the open for all to see snaking through the hamlets and fortresses of southern Scotland. King Bridei wanted everyone to see that Ecgfrith was dead, and in his possession. The great English foe whose kingdom had enslaved Pictland for so long was slain by the Picts. We can expect some noble English captives coming along. Can it be a coincidence that on Iona Ecgfrith’s half-brother waited with Bridei and Aldfrith’s common friend, Abbot Adomnan of Iona? No doubt both the Dalriadans and the Picts, who all looked to Iona as thier mother church, relished the death of Ecgfrith and his burial there under their control was a political statement. We must remember that Iona at the time was a school for princes, like Aldfrith and perhaps Aldhelm (see here), and possibly Irish nobles as well. Adomnan was perhaps the most political of all of the abbots of Iona, at least as political as Columba. At the enactment of Cain Adomnan (Adomnan’s Law / Law of the Innocents) marshalled every king in Ireland and Scotland were guaranteers of the law. So the dead English king is laid on Adomnan’s doorstep and his pupil Aldfrith becomes his successor… A year later after Aldfrith is installed – undoubtably with the aid of Duke Berht – Abbot Adomnan arrives at Bamburgh to bring Irish hostages from Ecgfriht’s attack on Ireland (684), by then two years later. Adomnan is successful acquiring some, but not all, hostages. He returns several years later and redeems more hostages. A few years later Adomnan sits in grief next to the body of his friend King Bridei, which is also brought to Iona for burial. We don’t know how Bridei dies but it is several years later. Clarkson notes that there is no way that the burial of Ecgfrith’s burial on Iona could have been acceptable to the Northumbrians. Ecgfrith, like his mother, had been an opponent of the Irish church. 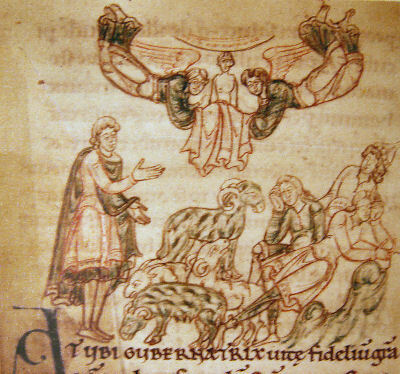 Ecgfrith did support Lindisfarne but by his time it was devoted to Rome. Ecgfrith’s insistence that his friend Cuthbert become Bishop of Lindisfarne may have had more to do with Lindisfarne’s proximity to the royal fortress of Bamburgh where the king would have ready access than any support for the formerly Irish church. 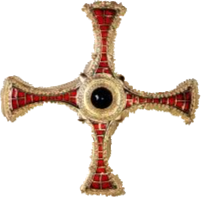 Lindisfarne was also Ecgfrith’s ally in breaking Bishop Wilfrid’s power. Clarkson suggests that Whibty would have been the preferred site for Ecgfrith’s burial where his mother and sister were co-abbesses. He is probably correct. It has been suggested that Ecgfrith intended Wearmouth or Jarrow to be his burial church, and that is probably true, but he died before Jarrow would have been barely begun. Another possibility would have been the monastery at Carlisle where his sister-in-law was abbess and his queen would later be abbess. This was probably a monastery founded by Ecgfrith for his sister-in-law in newly conquored territory. If his queen had any say in his burial, then he may have been there. None of these family members were consulted and Bridei’s will would prevail. 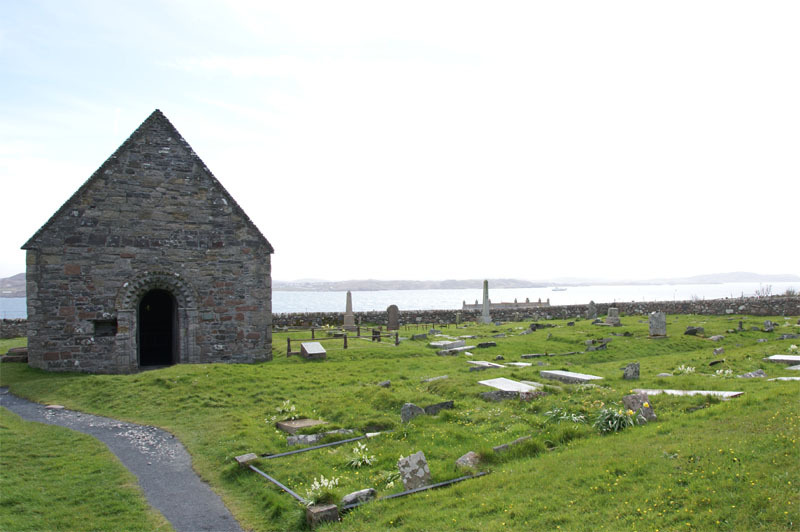 As a long time student of Iona, Aldfrith is unlikely to have objected and by the time the body got to Iona, quick burial would have been a necessity as decomposition would have been well under way. Symeon’s one line entry that Ecgfrith was buried on Iona tells us a great deal about the aftermath of the battle of Dunnichen. The victory tour is my idea; Tim doesn’t go quite that far. Adomnan’s role is also my idea… Tim just got me thinking about it. Another easy-to-fix (the best kind) typo: the attack on Ireland was 684, not 584. This is an interesting notion, the display of the body as travelling trophy. Thank you. Also my appetite is further whetted for Clarkson’s The Picts. I’ll move it up my TBR pile.